Think of it! Where would the English-speaking world be without the contributions of Charles Dickens, Emily and Charlotte Brontë, Jane Austen, J.R.R. Tolkien, and other gifted writers, to inspire and enthrall us anew? For that matter, where would American if not British cinema be without exploiting the literary merits of the above-named authors to their fullest? Such is the case with Warner Brothers Studio’s Harry Potter and the Sorcerer’s Stone, their extremely faithful (a bit too faithful, perhaps) 2001 film rendering of writer J.K. Rowling’s wonderful children’s novel about the orphaned wizard-in-waiting, eleven-year-old Harry Potter, and the discovery of his new-found magical abilities. Known in the U.K. as Harry Potter and the Philosopher’s Stone, Rowling’s original title was altered and published in the U.S. and other countries under the Sorcerer’s Stone banner (a common practice, it would seem — see Philip Pullman’s The Golden Compass for more information). Regardless of which name they are known by, the Harry Potter books were — and remain so to this very day — one of those unforgettable literary creations that continue to draw readers by the millions, both young and old, to its fantastical story line. Too, the subsequent box-office appeal of the movies have fed this thirst for more of this remarkable character’s adventures. Um, about those story lines: they may not be as “original” as they were initially thought to have been. If one can read between the lines, so to speak, and see beyond the fanciful trimmings and ersatz Latin-based terminology, while overlooking the author’s imaginative blending of pre-existing plot elements with a modern, existential-like worldview, the intelligent reader (and, likewise, the observant moviegoer) can readily pick up on Ms. Rowling’s literary sources and influences. Let’s start with the basic premise, shall we? When Harry Potter, who’s been orphaned after his parents were mysteriously killed in a car crash (or so he’s been told), eventually learns of his amazing powers and magical background, he’s visited by a giant named Hagrid who encourages him to leave the harsh environment of his aunt, uncle, and bully-boy cousin, a.k.a. the Dursleys (short for “desultory,” one gathers), and go off to hone his new-found skills at Hogwarts School of Witchcraft and Wizardry. Hmm … rather like the premise for Charlotte Brontë’s Jane Eyre, don’t you think? The orphan Jane, bullied and harried by her late father’s sister and abused by her aunt’s sniveling brood of brats, is whisked away to an orphanage to “correct” her belligerent behavior. 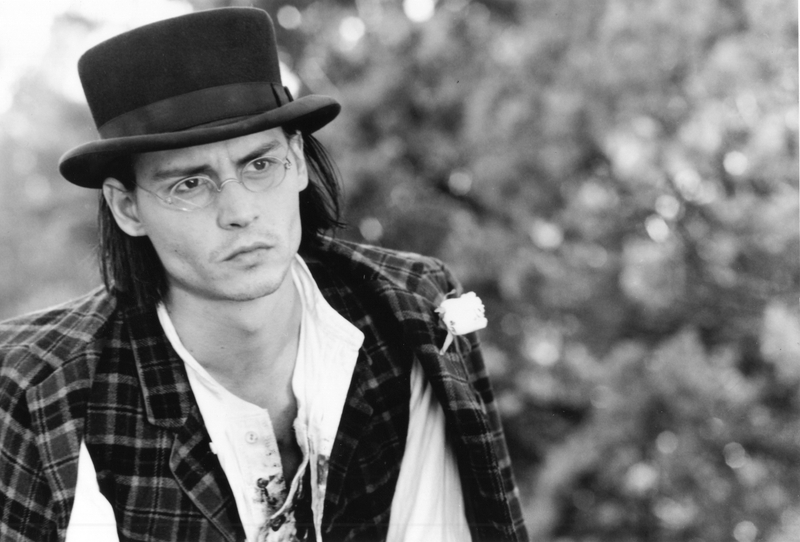 Or how about the character of Pip in Dickens’ Great Expectations (that little old wand-maker Mr. Olivander’s statement to Harry that “We can expect great things from you” is the lead-up to that connection). Or take, if you will, the novel Oliver Twist, a story with more “twists” and turns than those mystical, magical labyrinths Rowling is so fond of citing in her later Harry Potter and the Goblet of Fire (2005), one of the series’ more elaborately worked out projects. 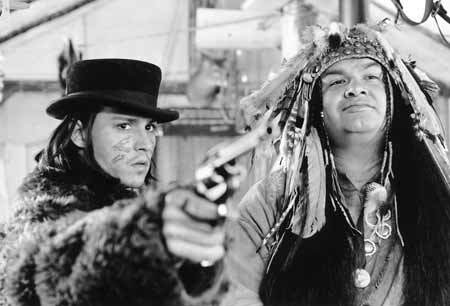 Young Oliver is brought up in a veritable nightmare of an orphanage, only to be rescued by a band of street urchins, led by the Artful Dodger, and shown the wonders of picking a pocket or two by the rabbinical looking Fagin (Professor Snape, is that you?). What about David Copperfield, Dickens’ most ambitious, autobiographical depiction of Industrial-age Britain at its worst? Would you agree that Mr. Micawber, so flamboyantly portrayed by W.C. Fields in MGM’s 1935 film classic, is nothing more than a rumpled, soused-up personification of Hogwarts’ groundskeeper Rubeus Hagrid — a fellow whose main purpose in movie life (outside of helping dragons hatch out of their shells) is to act as a makeshift deus ex machina, coming to Harry and his friends’ aid (and vice versa) whenever the situation warrants it? And speaking of which, what can one make of Professor Albus Dumbledore, the dean of Hogwarts School, a wizened old soul straight out of Tolkien himself? His bedside manner and resigned recapitulation of events (don’t forget the wispy white beard), as Harry lies in the school’s hospital ward recovering from his near-fatal experience with He Who Must Not Be Named, rekindle fond memories of a similar encounter with the White Wizard Gandalf and a wounded Frodo Baggins, from Peter Jackson’s Lord of the Rings: The Fellowship of the Ring, which premiered in 2001 — coincidentally, about the same time as Harry Potter and the Sorcerer’s Stone was released. The same sensibility that governed such classics as the aforementioned David Copperfield, Great Expectations, Oliver Twist, The Life and Adventures of Nicholas Nickleby, and A Christmas Carol, not to mention Jane Eyre and, in particular, Thomas Hughes’ Tom Brown’s School Days (doesn’t Slytherin House’s bratty, blonde-haired Draco Malfoy, that snot-nosed, bigoted, and conniving upper-class rich kid, remind you of the intractable Flashman?) is at work here, which only deepens one’s admiration of, and appreciation for, Jo Rowling’s genius for invention and adaptation. If she’s come “this close” at times to outright plagiarism, Rowling has managed to avoid prosecution by her cleverness and imaginative use of language and locales. And despite numerous lawsuits to the contrary, they’ve all been thrown out in court. Take that, you Heep of infamy! Notwithstanding the foregoing analogies, there are many memorable moments in the spectacular 2001 movie production, the first (and best, in our opinion) of the protracted series, including the congregation of owls sequence at the Dursley’s (with its hundreds of letters fluttering about), the giant Hagrid’s door-busting entrance, the fog-enshrouded boat ride to Hogwarts School, the fabulously executed Quidditch match (watch out for those bludgers, fellas!) with its knowing parody of Ridley Scott’s Gladiator, the troll attack in the girl’s lavatory, the life-size chess match (with Harry’s best friend, Ron Weasley, leading the charge), and the frightening encounter with the Dark Lord Voldemort in the Forbidden Forest. For the adults, there’s an outstanding Who’s Who of Her Majesty’s supporting players — insisted upon by J.K. Rowling herself — including the soft-spoken Richard Harris as Professor Dumbledore, sad-eyed Maggie Smith as Minerva McGonagall, Robbie Coltrane as Hagrid, Alan Rickman as Professor Snape, the snooty Defense against the Dark Arts teacher, along with Richard Griffiths, Fiona Shaw, Julie Walters, Ian Hart, Warwick Davies (Willow), and former Monty Python regular John Cleese in a bit part as the ghostly “Nearly Headless” Nick. There’s even a cameo by that old scene-stealer himself, John Hurt, as Mr. Olivander, purveyor of fine wands since 362 B.C. You couldn’t find a more Dickensian group of thespians anywhere! For the kiddies, there are star-making turns by the young Daniel Radcliffe (who previously played the young Oliver Twist, by the way, in a BBC television miniseries) as Harry, Rupert Grint as his redheaded buddy Ron, and especially Emma Watson as the bookish Hermione Granger, as well as Matthew Lewis as never-say-die student Neville Longbottom. A superbly flavorful score by veteran composer John Williams, destined to become a classic in its own right, is pure icing on this frothy concoction. Not a minute of screen time goes by without hearing some musical trace of Williams’ score. 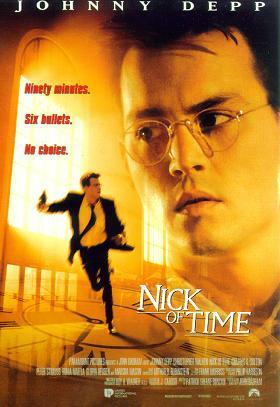 The marvelously condensed screenplay by Steve Kloves (he did most of the other entries as well) pares the novel down to the essentials while still capturing its essence — a most remarkable job overall; while the production as a whole is directed in grand style by Chris Columbus (Home Alone, Mrs. Doubtfire). Some scenes may be a bit too intense for younger viewers, most notably the entrance of the evil wizard Voldemort. Otherwise, this is fine family entertainment all-around and highly recommended. 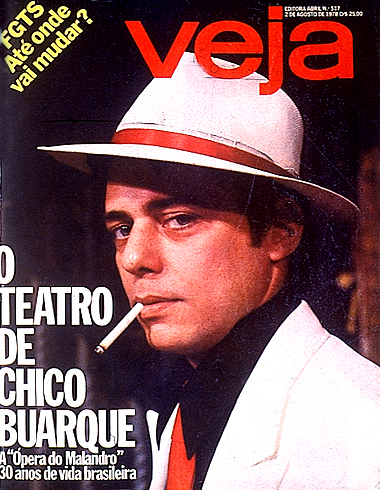 The series took off in (ahem) high-flying fashion with this version. As for the rest … some of the later offerings are better than others, but the final films in the eight-film series leave much to be desired. They have more in common with the green glare of the Twilight “vampires vs. werewolves” aesthetic than to the boarding-school one of the earlier movies. But don’t let that stop you from enjoying what I feel is an incredible cinematic ride through the fantasy realm. 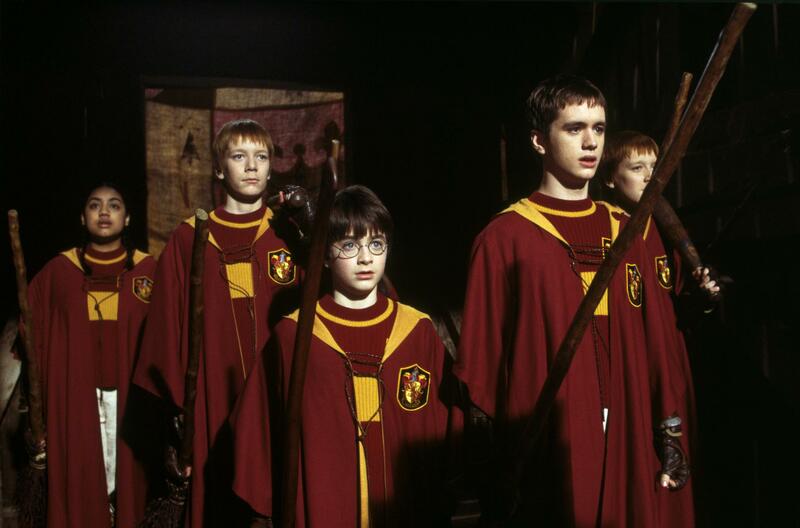 Produced by David Heyman; directed by Chris Columbus; screenplay by Steve Kloves, from the novel by J. K. Rowling (known elsewhere as Harry Potter and the Philosopher’s Stone); cinematography by John Seale; production design by Stuart Craig; costume design by Judianna Makovsky; edited by Richard Francis-Bruce; music by John Williams; starring Daniel Radcliffe, Rupert Grint, Emma Watson, Richard Harris, Maggie Smith, Robbie Coltrane, Alan Rickman, Richard Griffiths, John Hurt, Fiona Shaw, Ian Hart, and Julie Walters. Color, 152 min. A Heyday Films 1492 Pictures release, distributed by Warner Bros. Pictures. ‘The Madness of King George’ (1994) – God Save the King? God Help Us All! 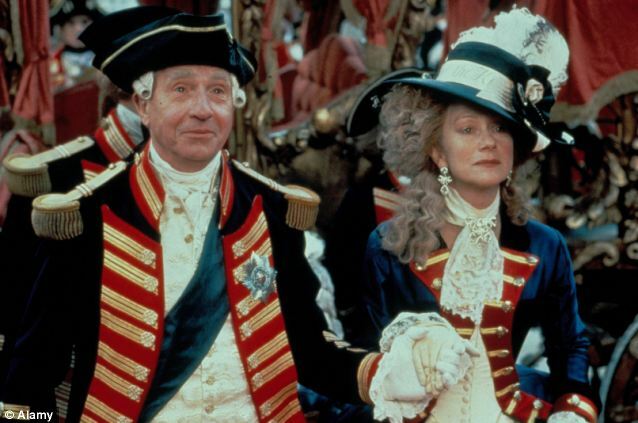 Moviegoers may fondly recall one of the finest costume dramas of years past, The Madness of King George. Directed by Nicholas Hytner (The Crucible), the 1994 film version of Alan Bennett’s play, The Madness of George III (which was also directed by Hytner), dramatized the plight of England’s eighteenth-century sovereign George III, magnificently re-enacted by the late Nigel Hawthorne (“What, what!”), who repeated his successful stage role for the screen. In particular, we remember how that same monarch — who lost the American colonies to a bold, grassroots movement — was suddenly struck down in the prime of his life by a mysterious ailment, all the while behaving rather “irrationally,” to put it mildly, toward his wife, Queen Charlotte (a steadfast Helen Mirren), and her ladies in waiting, while spewing forth all-manner of childish prattle; then, ultimately being “cured” by minister-turned-medic Dr. Willis (the no-nonsense Ian Holm, in his pre-Bilbo Baggins days), who uses the most unconventional of methods then available to science, in a sort of physician’s mind-over-monarch approach. In our more “enlightened” times, King George’s pet peeves, in fact, may turn out to have been a rare form of disease we know today as porphyria, an incurable affliction that attacks the body’s central nervous system. It manifests itself in various forms, including abdominal pain and tachycardia, as well as unreasonable behavior toward individuals (i.e., boorish shouting, constant interruptions, and lewd remarks — and there was plenty of that in the film) and portentously dark urinary output. In the movie, the color of the king’s “water” is a rather unsettling shade of blue. While all this is transpiring behind the scenes, the king’s indolent eldest son (also named George, and played in appropriate, stiff-upper-lip fashion by a lazy-eyed Rupert Everett), is goaded into taking over his father’s throne by first having His Majesty declared a mental incompetent (good luck with that! ), then attempting to assume the role of a “democratically” appointed regent by allying himself with his father’s opponents. Now, now, Georgie! Behave thyself! When The Madness of King George was first released, it was considered a fairly scathing commentary on Queen Elizabeth II and her own purportedly dysfunctional royal family. Today, it bears closer scrutiny, for it depicts not only the disintegration from within of a fragile form of government (shades of the fractious U.S. Congress), but one that was entirely dependent upon the force and personality of a solitary, charismatic leader, that is, the king himself (paging Donald Trump). Nevertheless, the latest research from a St. George’s University in London study showed that the king may indeed have been suffering from mental illness all along. After a lengthy examination of the hundreds upon hundreds of letters the prolific George III sent to various and sundry individuals throughout his long reign, the research team concluded that, because of the sovereign’s wordiness and use of complex language and vocabulary — in addition to his overly colorful epithets and breathless loquaciousness — he may also have experienced one of the earliest documented incidents of bipolar disorder. As for the blue-tinted urine, that was explained by the royal physicians’ ministering of a medication derived from the gentian plant. With its deep blue petals, the plant is still in use today as a mild sedative or tonic that could turn one’s urinary output blue (What, what?). With the king’s return to “normally acceptable” court behavior, a parliamentary crisis is averted and the English monarchy resumes its steady-as-she-goes course for a grand total of 60 years under His Majesty’s rule. The newly put-forth diagnosis of mental illness, mixed with the dual-personality issues, appear to have finally addressed the notion that the madness of King George had a psychological as well as a neurological basis. That George III eventually recovered his wits about him, and came back, full-throttle, to lord it over his wayward son — and put down those poor unfortunates who came ever-so-close to fomenting out-and-out rebellion against his realm — was not lost on modern movie audiences. Produced by Stephen Evans and David Parfitt; directed by Nicholas Hytner; screenplay written by Alan Bennett, from his play The Madness of George III; music by George Fenton and George Frederic Handel; cinematography by Andrew Dunn; edited by Tariq Anwar; starring Nigel Hawthorne, Helen Mirren, Ian Holm, Rupert Everett, Amanda Donohue, John Wood, and Rupert Graves. 107 min. Distributed by Samuel Goldwyn Company. Mozart, Verdi, and Wagner – of the three composers discussed so far, the most difficult for the average Joe to swallow in one gulp (if at all) is undeniably Wagner. Certainly his philosophy of life, radical politics, spurious religious musings, and overtly racist tendencies (especially where it concerned the Jewish population of his time), are what give most folks the jitters. I dare say that for me personally, those issues were not what kept me from appreciating opera’s most demanding genius, as author William Berger liked to phrase it. Specifically, the composer’s exacting music and the expansive length of his works were what prevented me initially from enjoying this most self-absorbed of individuals. Once I paid closer attention to his output, however – whether in live broadcasts, in the theater in live performances, or on LP recordings and cassettes – while following along with a German libretto and a semi-decent English translation of the same, I finally “got it,” by George, with respect to Wagner’s dramatic sensibilities. Even as complex a work as Parsifal, which can permanently turn any number of novices off, can seem like child’s play given repeated exposure to the composer’s musical vocabulary and insightful aesthetic. Some readers may find the following admission surprising but of the three artists mentioned above, Herr Mozart has always been the most challenging for me to grasp. At first glance, he may appear to be the easiest to comprehend and to like. In comparison, Verdi’s music grows on you quickly, as does Puccini’s, who we’ll discuss below; indeed, both these fine composers captivated me from the moment I first heard them. Wagner took a bit of doing, of course, although I was familiar with his concert pieces (including overtures, preludes, interludes, the Siegfried Idyll, and such) from early youth. But Mozart! Oh, how I suffered with trying to get to know him better. Why was that? Why did Wolfgang Amadeus Mozart cause me so much grief where the others did not? I can’t put my finger on it, except to say that Mozart can be deceptively simple to uninitiated ears. He was, after all, a classically trained and inclined composer (he was good friends with Joseph Haydn, and was intimately familiar with the music of his great German predecessor, Bach), as well as a masterful musician and orchestrator – which basically meant he followed the established musical order of the day, albeit with pre-Romantic-era notions. His works all bear a certain stamp of complexity, a breadth, a scope, a chromatic harmonization, along with a predisposition toward symmetry, that lesser composers failed to achieve. Yet Mozart’s music is approachable – sublime, according to most scholars, sophisticated and cultured, but always approachable. This seeming dichotomy took a while for me to resolve. In fact, I had the darnedest time overcoming this barrier, a barrier most people come to reconcile with only after listening intently to his works on a regular basis. Most assuredly, after seeing Peter Shaffer’s play Amadeus on stage, and then in a successful film version, I was totally swept up in Wolfie’s world. It wasn’t so much playwright Shaffer’s childlike depiction of the Salzburg born composer that so captured my imagination, but the way Mozart’s works came across with such power and conviction – especially Don Giovanni, The Magic Flute, and the Requiem Mass. Thank you, Mr. Shaffer, for your play, and thank you, director Milos Forman, for your film — and for redirecting my focus toward Wolfgang, whom I had previously avoided. Most listeners new to Mozart soon develop their own personal favorites. And there are many operas to choose from, for Wolfgang Amadeus was a prolific purveyor of different styles of the form – from tragic to comic, from the fanciful to the whimsical. The tragedies (or, if you will, the “histories”), which in their time were referred to as opera seria (“serious opera”), included such works as Mitridate, Re di Ponto (“Mithridates, King of Pontus”), Il Sogno di Scipione (“Scipio’s Dream”), Lucio Silla, Idomeneo, Re di Creta (“Idomeneus, King of Crete”), and La Clemenza di Tito (“The Clemency of Titus”). The comedies – with some of them being the most inspired inventions penned by the hand man – featured the charming Bastien und Bastienne, La Finta Semplice (“The Feigned Simpleton”), La Finta Giardinera (“The Pretend Garden Maid”), The Abduction from the Seraglio, his first big hit, and the one-act The Impresario. 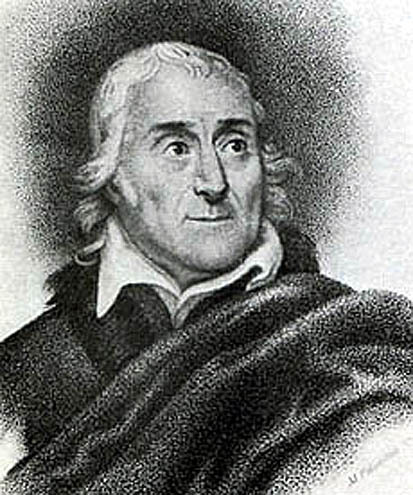 For most fans, though, the works that will be forever associated with him are the ones Mozart collaborated on with Venetian-born librettist Lorenzo Da Ponte, i.e., The Marriage of Figaro, Don Giovanni, and Cosi fan tutte (“Women Are Like That”). Da Ponte, an amazingly versatile talent (and an inveterate womanizer) who knew the infamous Casanova personally, as well as spoke several languages fluently, was a genuine man of the Enlightenment. Among the numerous posts he held during a richly varied career, Da Ponte is probably most well known in this country for teaching Italian literature at Columbia College in New York. Notwithstanding the above association, Mozart’s last opera, The Magic Flute, co-written with impresario, theater owner, and fellow Freemason Emanuel Schikaneder, who provided the story and structure, managed to straddle both the comedic and dramatic in fairly equal proportions, in this, his final statement on the subject. 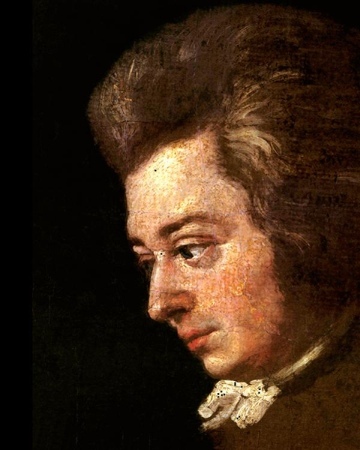 The richness of his musical language and the profoundness of his observations about the human condition can only lead one to conclude, without the slightest exaggeration, that Wolfgang Amadeus Mozart was the Shakespeare of the operatic stage. 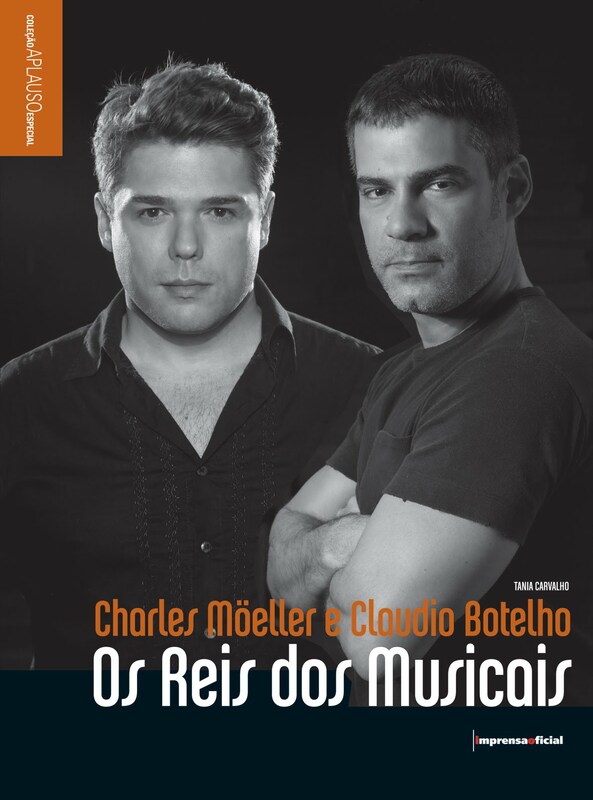 The last, but certainly not the least, of our operatic hit-makers is also one of the most beloved. Giacomo Puccini was no doubt destined for operatic greatness. By the time of his birth in December 1858, there had been five previous generations of Puccinis, all of them composers and/or musicians of one sort or another. Sadly, little Giacomo turned out to be the last of that distinguished line. In his later years, Puccini wrote of a dream he once had as a youngster, where after traveling some distance to see a production of Verdi’s Aida, he collapsed in his hotel room from sheer exhaustion. In his dream, God came down from heaven and touched him lightly on the shoulder, promising him great success if he wrote for the theater. “Mind,” the composer said, recalling the Almighty’s admonition, “Write only for the theater!” Needless to say, Puccini took the Lord at His word: he became a dutiful man of the theater. Solidly middle class, the Puccini clan lived in a remote region of northern Italy where hunting and fishing were the main activities, but it was close enough to the principal city of Milan that he could enjoy music and theater, in addition to (ahem) other entertainment. Yes, dear readers: Puccini was another one of those incorrigible ladies’ men – and it was a good thing, too! For no other Italian composer of his era was as attuned to the feminine mystique as he was. A quick perusal of Puccini’s complement of female heroines tells the tale: the worldly, free-loving Manon Lescaut; the tubercular seamstress Mimi from La Bohème; the quintessential opera diva Floria Tosca; the former geisha-turned-loving mother Cio-Cio-San from Madama Butterfly; the cloistered, suicidal nun Sister Angelica; the spoiled-rotten daughter Giannetta from Gianni Schicchi; and the loyal slave girl Liu from Turandot. All of them have tugged at our collective heart strings: we smile at their generosity of spirit, we laugh at their comically exaggerated antics, we frown at their willful ways, and we cry at their tragic fate — while applauding them wildly at the final curtain. They were all the creation of one man: Giacomo Puccini, from first to last an artist of considerable genius. When he was a young music student, Puccini and several of his colleagues, among them the future composer of Pagliacci, Ruggero Leoncavallo, lived the proverbial bohemian life. Their struggles for survival, their battles with hunger and the elements, with having to find enough money to pay the overdue rent and other innumerable privations, were immortalized in his timeless classic of young love, La Bohème. Puccini’s other great passion – smoking cigarettes – inevitably cost him his life. He developed cancer of the throat, and bravely endured experimental treatments in Belgium to combat it, all the while busying himself with trying to complete what would turn out to be his final work for the stage, the opera Turandot, one of the grandest of grand operas. Unfortunately, time ran out for the composer. 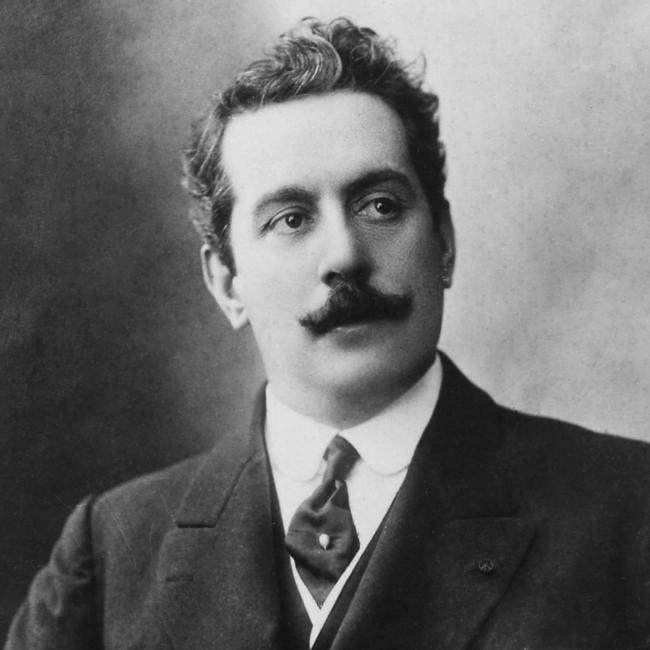 Puccini passed away in Brussels of a heart attack on November 29, 1924, at the age of 65. His body was transported back to Italy for burial at his estate near Milan. On April 26, 1926, his unfinished Turandot had its world premiere at the Teatro alla Scala. Another composer had been assigned the unenviable task of completing it. 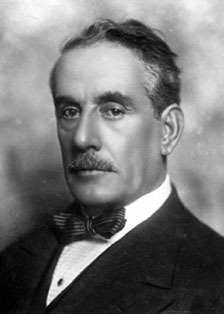 However, at about the halfway mark in Act Three – the exact spot where Puccini stopped composing – the conductor of the event, the formidable Arturo Toscanini, one of Puccini’s oldest and dearest friends, put down his baton, turned to the audience and announced, in a voice choked with emotion, “It was here that the Master laid down his pen,” whereupon Toscanini abruptly left the podium. The press later reported that the crowd had filed out of the theater in absolute silence. With Puccini’s passing, opera itself began to draw its own last dying breath. Certainly after him, no other Italian composer – and very few foreigners of any nationality – would be able to regale their fans in the same way as the Fab Four of Opera had. The lanky stranger, dressed from chin to toe in nightmarish black, held out his gloved hand to a darling little girl standing quietly by his side. The little girl shook the stranger’s hand, cautiously if not a bit reluctantly. She must have been no more than two. With her blonde curls and sweet, angelic expression, she was as pretty as a princess – Princess Leia, to be exact, but without the trademark hair extensions. After she had greeted this intimidating fellow, the girl’s father approached the stranger and asked if he could take his picture. “Sure thing,” signaled the stranger, with the politeness of one who’s been asked this question several dozen times a day, a natural part of one’s convention-going routine. In the blink of a Jawa’s eye, the stranger struck a more aggressive pose, baring his dark-stained teeth and flashing his bright-yellow eyes for the camera. At this, the little girl retreated a few steps, into the comforting arms of her mother. Her formerly watchful gaze had turned to fright, for the stranger revealed himself as Darth Maul, one of the Sith Lords of Stars Wars – Episode I: The Phantom Menace fame. “Thanks a lot,” the father acknowledged. 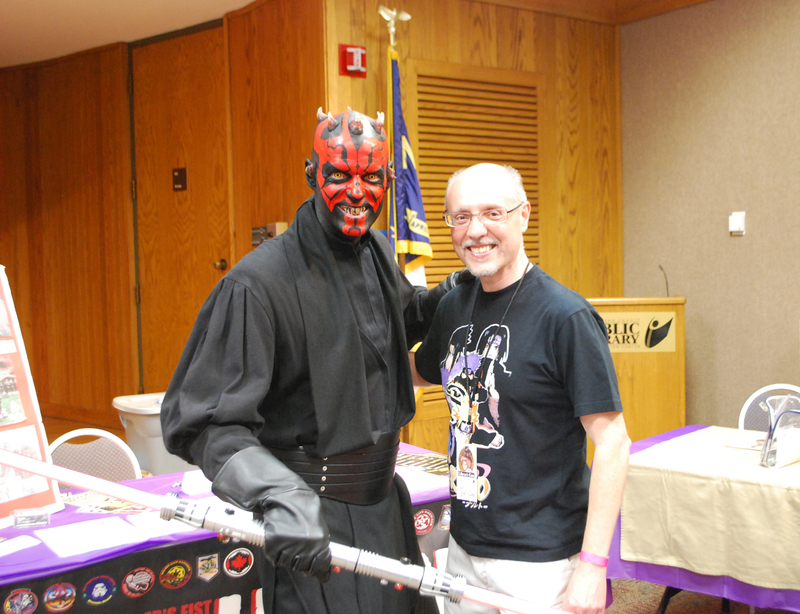 “My pleasure,” replied Darth Maul – or rather, ex-Army veteran Bill Lane, the man in nightmarish black behind the red-tattooed makeup, spiky horns, and yellow contacts. Modest and unassuming, Bill is a member of the Carolina Garrison, part of the Fighting 501st Legion of Storm Troopers, one of the world’s premier fan-based Star Wars costuming clubs. He was busy manning the display table at the Cumberland County Public Library’s “Librari-Con” Mini-Convention, in the library’s headquarters on Maiden Lane in Fayetteville, North Carolina. Despite the noisy atmosphere, Bill always finds time for visitors, well-wishers, and plain, old curiosity seekers (present company included). His task is to alert people to the garrison’s main cause. Founded in 1997 by Albin Johnson, a resident of South Carolina, the 501st Legion boasts an international association of some 5,000 members (known as “storm troopers”), with chapters (or “garrisons”) in over 50 countries worldwide. According to their brochure, the 501st is dedicated to spreading the magic and fun of Star Wars through authentic-looking costumes and arms. Their aim, throughout the years, is to become the “leading force in fan-based charity events” devoted to “brightening lives.” Their reward: the satisfaction of knowing they are bringing joy through their work and smiles to children’s faces. Garrison members are not compensated for their time, nor are they reimbursed for travel or other expenses. They do what they do for the sheer pleasure of doing it. Bill started down the charity-event road back in 2003, when he was stationed in Alabama. It was during the Halloween season, he recalled, that his son expressed a desire to dress up as Darth Vader. “That’s great, son,” Bill said. But then, the son asked the father to dress up along with him – as, wouldn’t you know it, Darth Vader. Bill couldn’t resist the challenge. I’m sure he felt (as many others had, too) that this reversal of the age-old order of things – i.e., “the transmission from fathers to sons of the powers of both good and evil” – was not the usual quick-and-easy path for a Sith Lord to take. Though no outward expression of evil (what Star Wars fans commonly refer to as the “dark side”) was ever intended, certainly the power of good (or the “Force”) was unquestionably conveyed in ways Bill had no means of measuring. Quite unexpectedly, his spot-on personification of the dreaded Dark Lord was noticed by storm troopers from the local 501st Legion, resulting in an invitation to join their ranks. He accepted without hesitation. In 2007, Bill and his family relocated to Fort Bragg, where he joined the Carolina Garrison of the Fighting 501st, which serves both North and South Carolina. 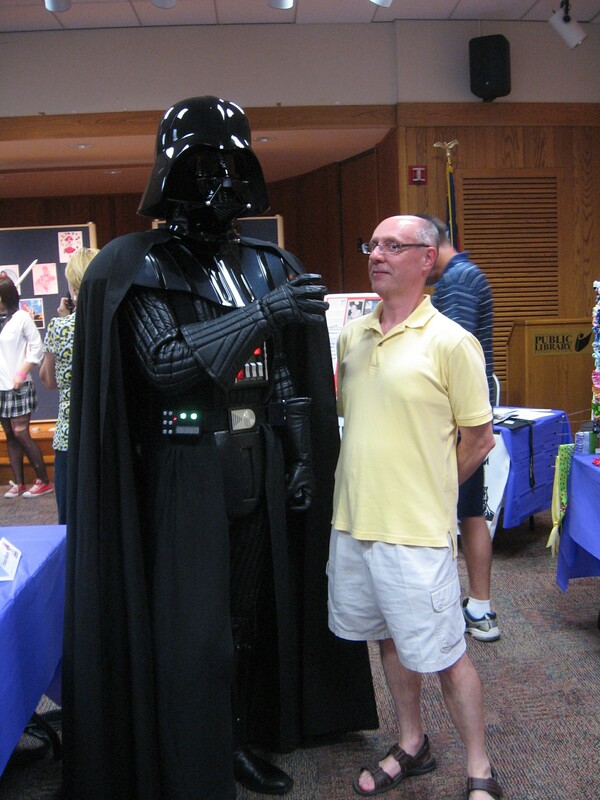 During one of their frequent charity appearances (“It was at the Jordan Lake Pediatric Brain Foundation,” he added), Bill was once more dressed up as Darth Vader. While in his distinctive costume and iconic headgear, Bill casually walked up to one of the kids in attendance and noticed the child’s face light up brighter than Luke Skywalker’s light-saber. This was no Jedi mind trick, he reckoned, but the real deal. “That did it. That’s when I knew this is what I wanted to do.” But playing “dress up” with Star Wars figures isn’t all fun and games. 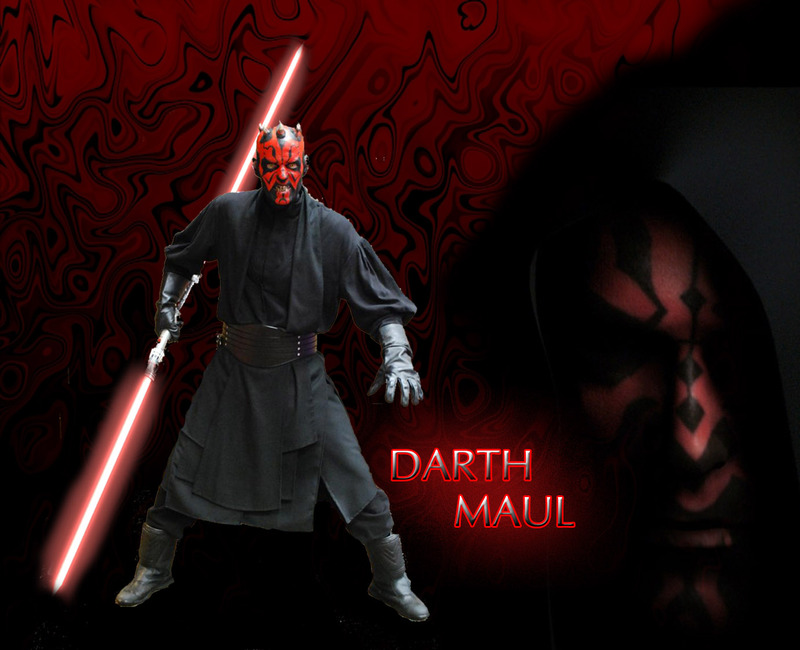 He estimates the cost of impersonating Darth Maul (including makeup, boots, and double-edged light-saber) at around $800. His Darth Vader outfit, which is modeled on the same one the character wore in Episode III: Revenge of the Sith, tops out at an astronomical $3,000. While most garrison members relish playing the “bad guys” – from Sith Lords, Imperial guards, and Galactic storm troopers, to bounty hunters Boba and Jango Fett – a fair number of “good guys” are given equal billing, most notably the aforementioned Obi-Wan Kenobi and Luke Skywalker, along with an incredibly accurate Chewbacca. Played by six-foot, four-inch trooper Ryan Ricks, Chewie’s individually hand-stitched costume and furry feet add about a foot to his already imposing frame, right up to the “regulation” Wookiee height of seven-feet, five-inches tall. 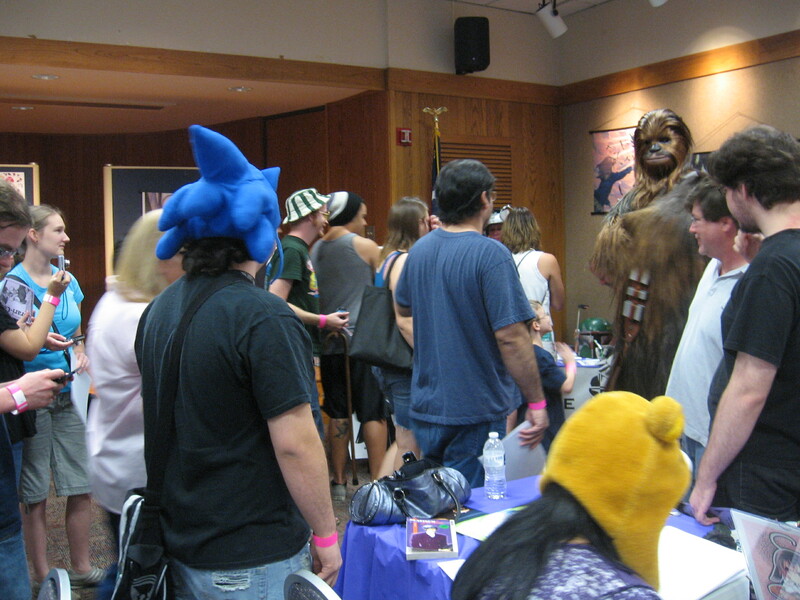 No doubt Chewbacca and his Star Wars cohorts command plenty of attention wherever they go. But there are also serious undertones to all the hoopla, most of which came about through the troopers’ personal connection to a family member’s terminal illness. Katie Johnson, the six-year-old daughter of the 501st Legion’s founder, Albin Johnson, was diagnosed about a decade ago with an inoperable brain tumor. Katie fought long and hard to overcome this implacable foe, but eventually lost her battle with cancer in the summer of 2005. “It’s all about easing their pain,” Bill noted. 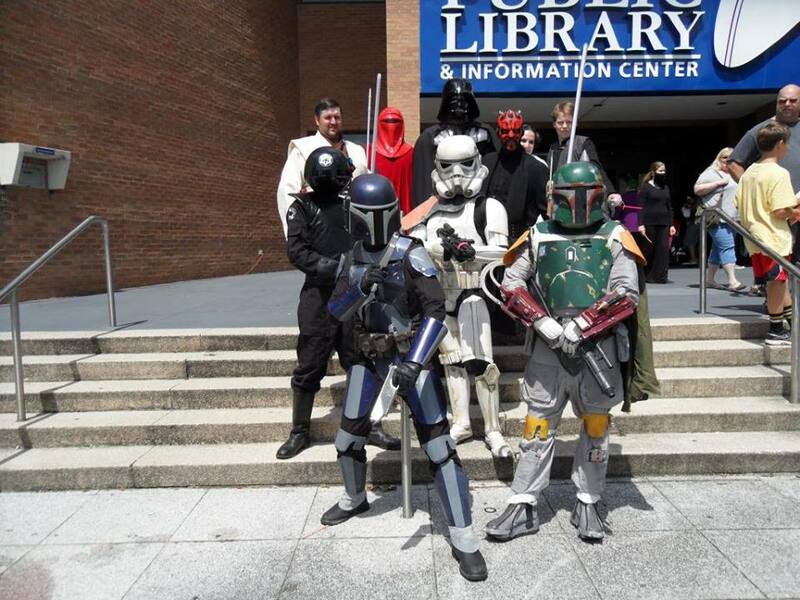 In addition to Make-a-Wish, the 501st participates in all sorts of charity benefits, including parades, children’s hospital visits, conventions, library visits, and concerts, with appearances at company functions and movie premieres thrown in for good measure. They make regular excursions to Duke Children’s Hospital, in Durham, and Breast Cancer “Walk for Life” rallies, as well as the Juvenile Diabetes Foundation and Toys-4-Tots toy drives, among other charitable activities. Unfortunately, the odds of beating pediatric brain cancer depend entirely upon the type and location of the tumor. But there are a few success stories. As luck would have it, the survivor won the raffle and made off with the FireAntz jersey. “What are the odds of that happening?” Bill asked. I’d say about 3,720 to 1, but then I never successfully navigated an asteroid field, let alone won a jersey in a raffle. This goes to show that underneath the red-and-black makeup and spiky horns, even a Sith Lord, one as fearsomely determined as that of a former Army veteran, can have a heart of gold. He may have joined the metaphorical dark side, but the Force remains strong with this one, and with the Fighting 501st.